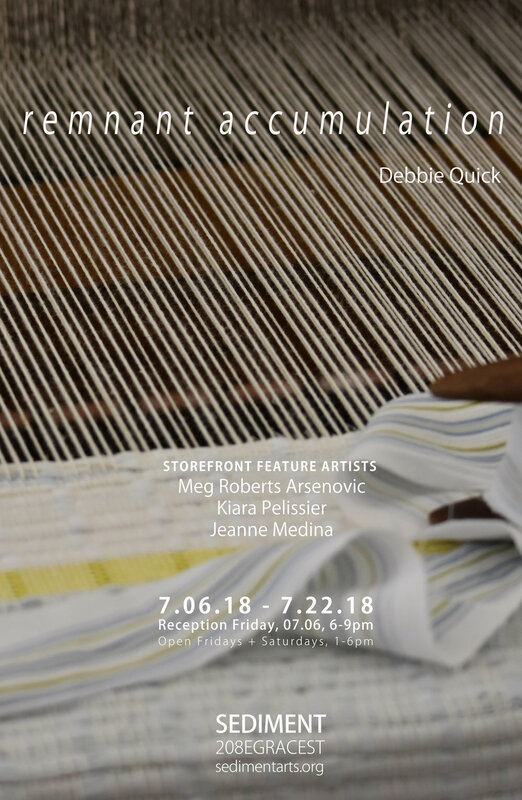 Sediment Art presents Remnant Accumulation by Debbie Quick alongside a group show she curated featuring work by Meg Roberts Arsenovic, Kiara Pelissier, and Jeanne Medina. Quick states, "The Union 36 loom dates back to the 1900s. Once a source of supplemental income for blue collar farming families, the one in gallery at Sediment has been passed down to me through generations of women in my ancestral line. I'll be using it to explore the legacy of women's labor, place, and class through an endlessly growing amount of rag rug yardage that covers the gallery floor. In connecting to women’s labor, I've selected three women with labor incisive practices who are researching through the lens of accumulations and remnants."